I think you hit the nail on the head, Ken. Grain O's with lightning bolt marshmallows. I'm more concerned about the surprise toy inside! A secret decoder Flash ring? Also, I was waiting to see if you posted about these this week as I hadn't seen you mention them yet; but there is a second wave of Action League Flash figures out inspired by Flashpoint. I've seen 4 of them in stores, The Flash (a translucent repaint) and Citizen Cold, Cyborg and Element Girl, Project Superman and Batman and Wonder Woman and Emperor Aquaman, each with the other 3 listed on the back. I noticed yesterday at the new DC store, there's a fifth set, with a new Tornado Pull Barry that looks great and a Professor Zoom, albeit it Zolomon's eyes. A toy inside the box! That would have been perfect. I totally should have thought about that. The Flash ring is perfection, great idea. I have both the Cold and Zoom Action League sets currently sitting on my printer at home waiting for me to start taking some pictures. Expect a full write up on them next week. 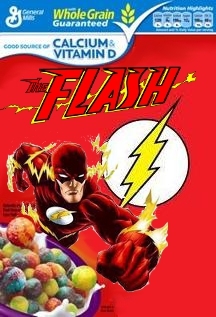 Flash cereal! 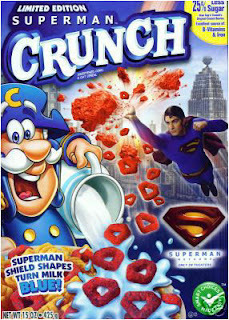 Containing over 2000% of your daily allowance of sugar and caffeine. Children will vibrate so fast, they'll fall through the floor. LMAO! Caffeine and ginseng induced marshmallow! Nothing like starting your day out right!